Not-your-average-hummus recipe! 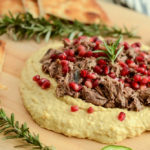 This healthy appetizer has way more going on than a simple chickpea spread – it’s loaded with juicy pulled lamb, fresh rosemary and pomegranate seeds. Well, hi there! 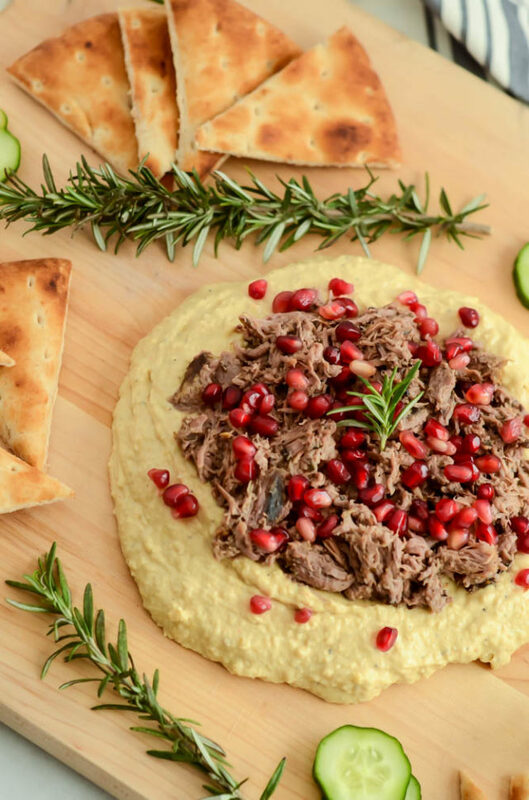 It’s been a while…Can I offer you a Loaded Mediterranean Hummus Board with Pulled Lamb to make up for it? I promise it’s just as good as it sounds (and more) and will quickly become a favorite meal of yours. Might I also add it would make a great, healthy option to feed the troops during Super Bowl this weekend? If you were a reader before, or perhaps have been following me on Instagram, you’ll know that the reason for my recent hiatus was because my husband and I welcomed our beautiful baby girl, Raia Marie, into the world in October. I had a good amount of content lined up for when she was first born, but then (as I’m sure you’ve heard) the perfect storm of unfortunate events hit our little community of Santa Barbara, first with the Thomas Fire and then with the Montecito Mudslide. Add to that a 10-day trip to Hawaii (where we infamously had a near miss with a ballistic missile attack) and you can see why it’s taken me a little longer than anticipated to get back in any sort of groove. This is the first time since mid-November that we’ve been home for an entire week, and I’m slowly figuring out a schedule (if you can call it that) with little Miss Raia where I can occasionally get a little bit of work done and, most importantly, get back in the kitchen! My new favorite method of cooking is, understandably, batch cooking. Since my time in the kitchen is quite sparse these days, when I DO have the time I love roasting up a huge tray of veggies or throwing a big cut of meat or various other ingredients into the slow cooker and letting it do most of the work. Bonus if I can figure something out using healthy ingredients because, man, breastfeeding is no joke and I’m way hungrier these days than I ever was while I was pregnant. 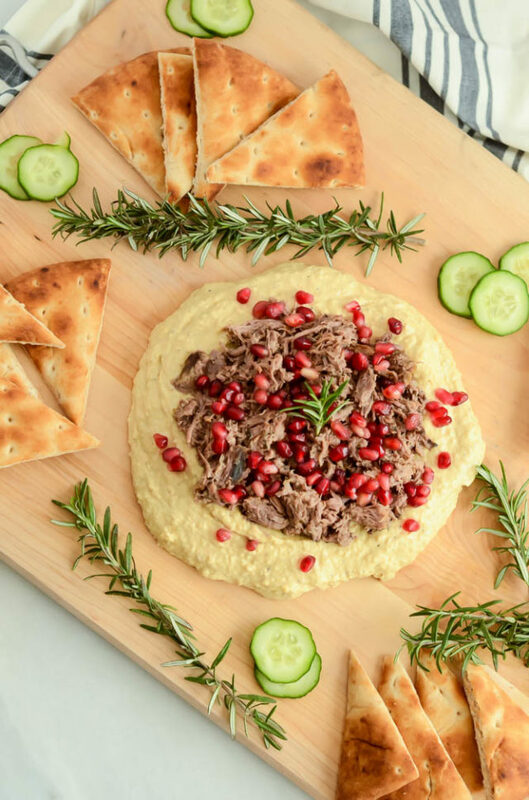 This Loaded Mediterranean Hummus Board with Pulled Lamb fits my need for easy to cook, filling and delicious recipes that, let’s be honest, can just as easily pass as an easy weeknight dinner as it can for a show-stopping appetizer for your next get-together. 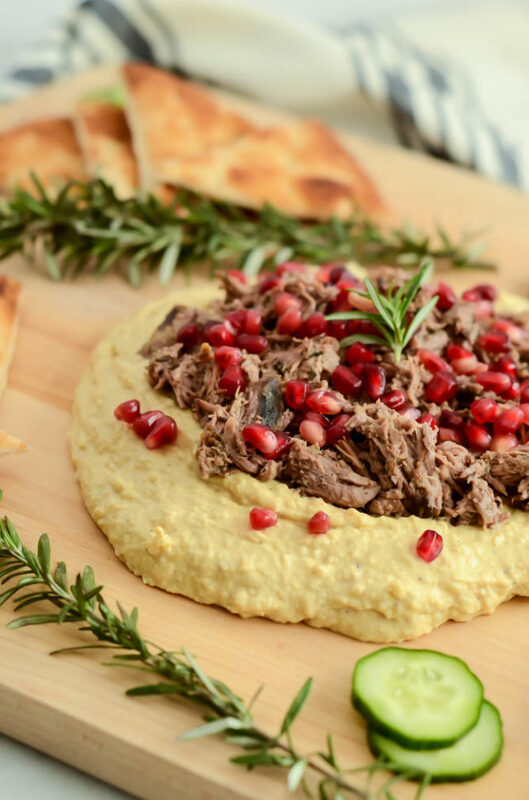 I’ve simply created THE most delicious slow-cooked lamb recipe that then gets dumped on top of creamy hummus which is then garnished with pomegranate seeds, fresh rosemary, cucumbers and the like. And don’t forget the pita bread! You could also go hog wild and throw on some fresh veggies like beets, carrots, radishes or whatever you prefer to enjoy your hummus with. Since my time is a bit limited as far as recipe development goes, I went with premade hummus and pita bread wedges for this go-around, but I know this whole setup will be equally (if not more) delicious if you decide to take the time to make all of these things from scratch. If you’re feeling ambitious, my friend Becky over at Baking the Goods has mastered the Creamy Dreamy Hummus from Tusk in Portland and you can click here for the recipe. Or, you can try one of the other hummus recipes I’ve shared on this site like this Roasted Cauliflower Hummus with Rosemary and Garlic or this Pumpkin Curry Hummus. I haven’t yet come up with my own recipe for homemade pita bread, but I’m sure you can’t go wrong with this Golden Pita Bread Recipe from King Arthur Flour or this tutorial on How to Make Pita Bread from The Kitchn. But for those of you who (like me) don’t have a lot of time on your hands, store-bought is just fine. Just be sure to find hummus and pita with as few ingredients as possible! As far as the lamb goes, it really couldn’t be easier since you probably already have most of the ingredients on hand in the pantry. Just head to your favorite local butcher and ask for the boneless leg of lamb (or lamb shoulder would work, too) and you’ll be well on your way to a tasty, healthy protein made in quite possibly the least hands-on way possible. Before I leave you with all the deets on how to create your own Loaded Mediterranean Hummus Board with Pulled Lamb, be forewarned that this lamb recipe will leave you with wayyy more lamb than you will ever need piled on top of your hummus. Well, I’m giving you permission to use the extra to whip up lamb tacos, a Greek casserole, or even pulled lamb sandwiches to get ya through the week. I’m learning now more than ever that there is so much power in leftovers! Not-your-average-hummus recipe! 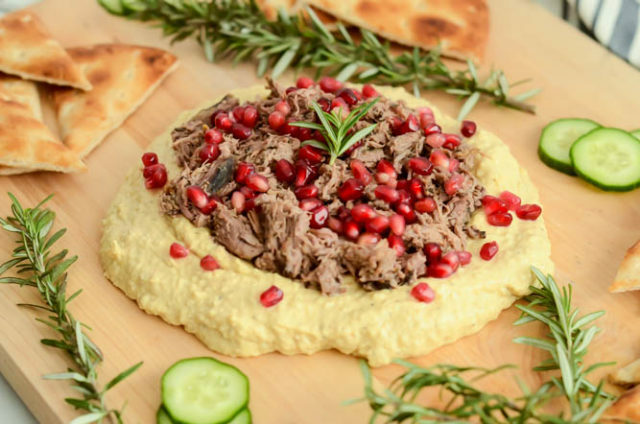 This healthy appetizer has way more going on than a simple chickpea spread - it's loaded with juicy pulled lamb, fresh rosemary and pomegranate seeds. Drizzle 2 tablespoons olive oil in bottom of a large slow cooker. Add lamb and drizzle remaining 2 tablespoons of olive oil over top. Add garlic cloves, rosemary, oregano, mint, salt and pepper. Cook on low for 7 hours. Remove lamb from slow cooker and place in a large bowl, reserving the lamb’s juices in the slow cooker. Using two forks, shred the lamb until no big chunks remain. Drizzle on just enough of the reserved juices from the slow cooker so that the lamb is nice and moist without having too much extra liquid in the bowl. Season with additional salt and pepper to taste and set aside. To assemble, scoop hummus onto the center of a large cutting board or serving platter, swirling to create a sort of a well in the middle. Add pulled lamb to the well in the center. Top with pomegranate arils and fresh rosemary. Surround the hummus with sliced cucumbers, pita bread and any other vegetables you’ve decided to use and serve! This was so amazingly easy and tasty!!! Yum.